Allow us to integrate a state-of-the-Art Automation systems within you home or business. Most buildings today waste energy, are uncomfortable and are not very productive because they are over-lit. This is due to light levels set higher than appropriate for the space, or spaces are lit even when they are unoccupied. Adding intelligent, energy-efficient commercial lighting control can reduce energy costs and improve productivity. Audio Video Innovations can design and install a Lutron lighting system that is flexible and scalable and can fully integrate lighting, shading, and sensors for maximum energy savings. 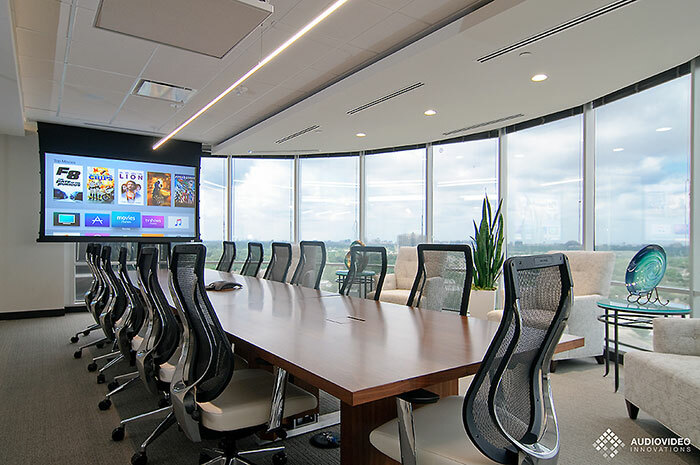 Lutron commercial lighting control solutions allow facility managers to have centralized control. They can conveniently manage lighting throughout the facility right from their desktop. They can control, configure, monitor, and report on the lighting for any space in the building to maximize energy efficiency and comfort. Commercial lighting control systems can incorporate an integral timeclock feature that enables the scheduling of lights. Both time-of-day (e.g., 8:00 pm weeknights) and astronomic time clocks (e.g., dusk or dawn) can enhance energy savings and the safety and security of employees. Stay on top of your energy consumption with reporting and trending from the lighting solution. Improve maintenance and simplify operations by monitoring energy consumption and identifying problems before they become an issue. The reporting and trending feature allows facility managers to monitor system activity, lighting energy usage, fluorescent lamp failures, and more to maximize potential savings. Let Audio Video Innovations design and install a commercial lighting control system to help save energy and improve productivity.